Recently we went through some typical socked in rainy west coast weather. Day after day of drizzle, rain and sometimes pounding rain. It’s the tradeoff for living in the emerald beauty that is the Pacific Northwest. While huddled in the rig waiting for the sun’s return, I couldn’t help but think about leaks and what an expensive mess they can make of an RV. 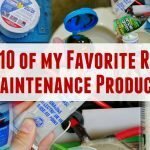 I sure was glad I had decided last fall to start beefing up the RV roof seals and seams. However, I did not quite complete my reseal project and the recent steady rains were a good reminder to get back at it. 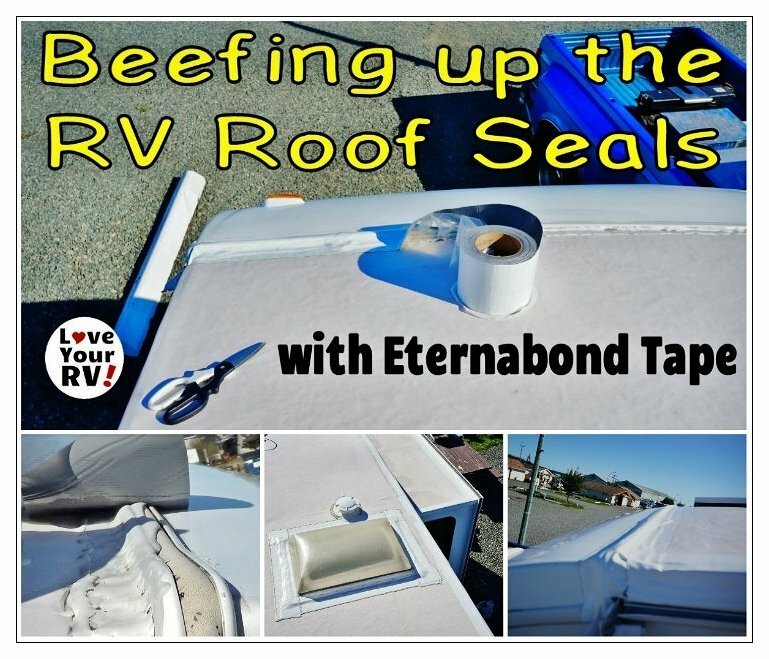 If you read my previous blog article you’ll know that a product called Eternabond roof repair tape is my choice for not only RV roof repairs but also for preventative maintenance. I decided to start the most vulnerable areas first and proceed to slowly cover all the roof seams and seals as time and money allowed. 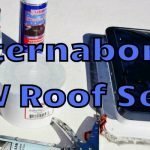 Last fall I resealed around all the roof vents, rear corners, part of the slide out roof area, and even used the tape to hold down my solar wiring. I was most impressed with the Eternabond. 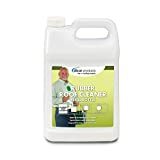 It can be a little tricky to lay down as it is so darn sticky, but that is also the good thing. Once it’s stuck down it stays stuck down. 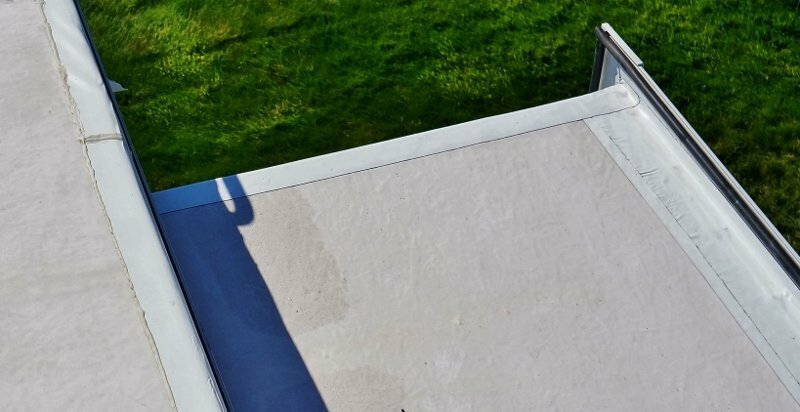 I put that first batch of roof tape on last December and it’s been through thousands of travel miles, wind storms, rain storms, harsh sun and is still looking as good as new. There are no signs of peeling or bubbles. 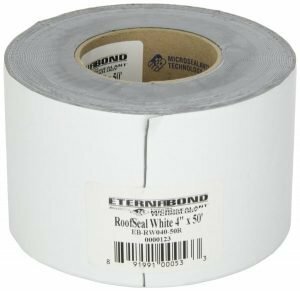 This summer I picked myself up another 50 foot 4-inch wide roof of white Eternabond. Unfortunately, Amazon wouldn’t ship it to Canada. Doh! I should have grabbed more while visiting. I was able to get the local Home Hardware to special order in though. For any of you Canuck readers, Home Hardware will ship it free to store for pickup. First thing I did with the new 50’ roll was give the slide out roof some attention. In my previous video, I showed a goof up by Keystone. They had left all of the slide flashing screws sticking out about a 3/8ths of an inch or so. On top of each screw, they added a big blob of silicone. So, at the time I added the roofing tape right over these screws. Now it was time to pull out those screws and put in some proper sized ones. I even decided to spend a few bucks extra and use stainless. A good thing about the Eternabond tape is it sticks to its self just fine. I simply added another piece of tape right over the new screws. I even decided to tape the side roof corners of the slide for some extra physical protection to the rubber roof material. I had noticed some chaffing going on in a few spots. This was likely caused by my water hose during roof cleaning events. 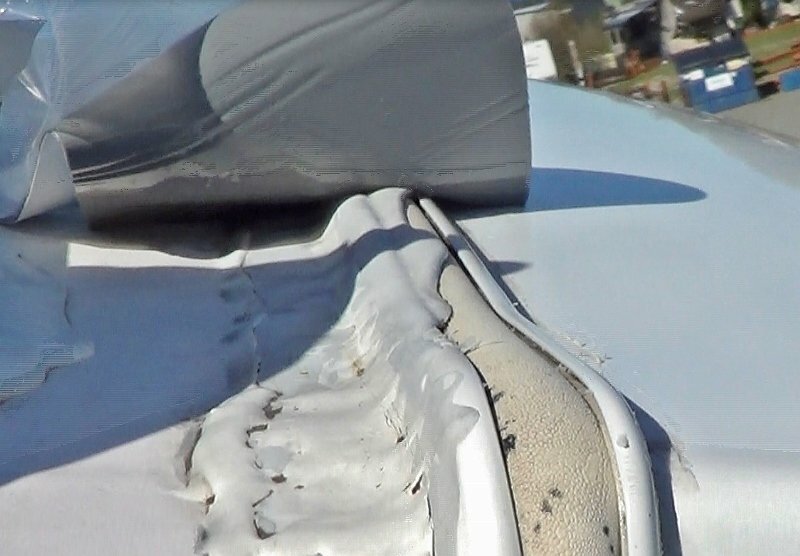 Next was the notorious front fiberglass cap seam. 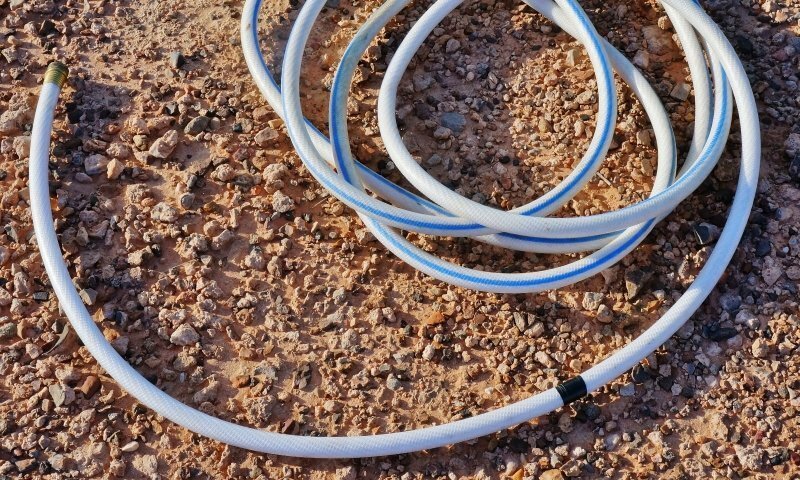 Many of you have probably heard of fifth wheel owners complaining of water leaks in the bedroom. 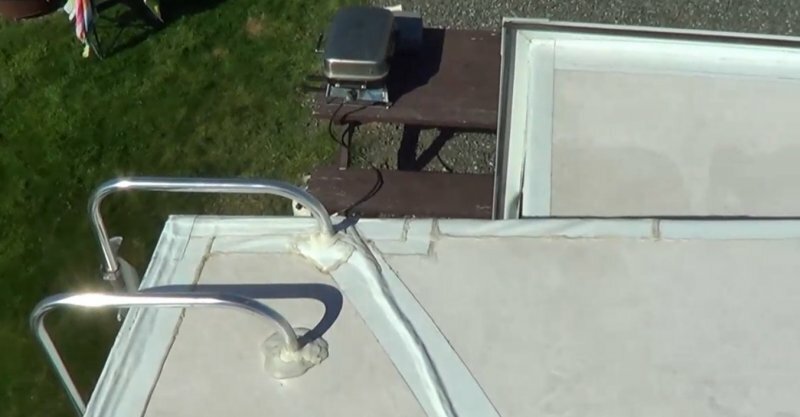 Right where the main roof joins the front fiberglass cap of the trailer is a very vulnerable spot on a fifth wheel and likely most other types of RVs too. Any leak here usually runs into the roof or bedroom walls. It can be a big rotting wood, moldy mess before you even notice it. It’s a tough place to maintain since it is so far forward on the roof and usually slopes away. The area is often neglected until it’s too late! I was eager to get a strip of the Eternabond across it. I added the strip right over the existing seam and Dicor Lap sealant, after making sure to clean it really well. I wrapped a small piece of tape around the back corner on each side of the rig. This is another very vulnerable leak area. I figure is can’t hurt, must be better than what is there to begin with. I then finished up the driver’s side roof gutter strip that I had partially finished in the fall. At this point, my tape roll is more than half done so I can’t do the other side’s gutter strip. But, I’m pretty pleased and feel confident in the roof having beefed up the roof seals on the most vulnerable areas. Once we get down to the sunny desert I’ll hit up Amazon for another roll of Eternabond and finish things off. 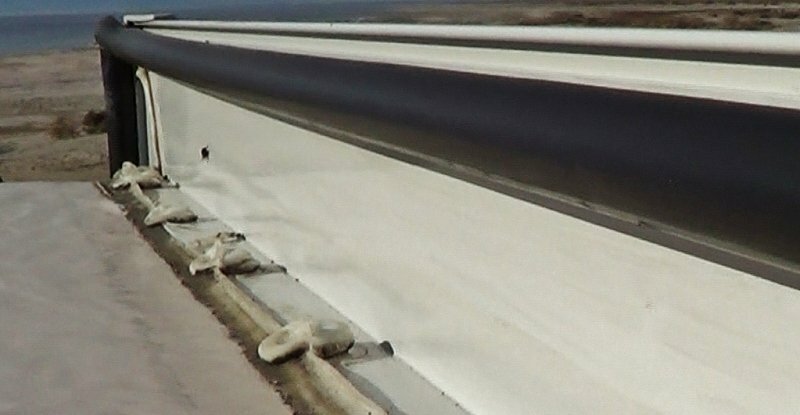 The tape may also prove handy to have on hand in case of a plumbing pipe leak or god forbid a cracked waste tank. See many more RV Mods and Upgrades from Love Your RV!